I am copying a couple of pages and charts here, of the materials most likely to cause symptoms from exposures and some of the typical symptoms people experience, as well as linking to resources. With the increase in pipeline “accidents” and fracking, we are seeing many more people exposed to high amounts of petroleum and byproducts, which can cause MCS/ES in addition to other types of chemical injury and chronic illness. People with sensitivities have individual susceptibilities to various environmental factors. As seen in Table 6, the more common agents that trigger reactions in susceptible people include pesticides, volatile organic compounds (VOCs) such as solvents, perfumes, formaldehyde and other petrochemicals, vehicle exhaust, moulds, pollens, foods, animal danders and electromagnetic phenomena. These may arise from the workplace structure, furnishings, equipment, exterior surroundings, cleaning products or from co-workers and clients. Other aspects of the environment, including electromagnetic radiation, currents and fields, lighting, humidity, heat, cold and noise may also exacerbate environmental sensitivities. Once people are initially sensitized to low levels of environmental factors, if the condition is not recognised and addressed they may experience reactions triggered by a broader range of exposures. In this two-stage process, environmental sensitivities may develop gradually with chronic exposure to relatively low levels of chemicals as seen in “sick buildings,” or suddenly after a major exposure to an environmental disaster or a chemical spill. 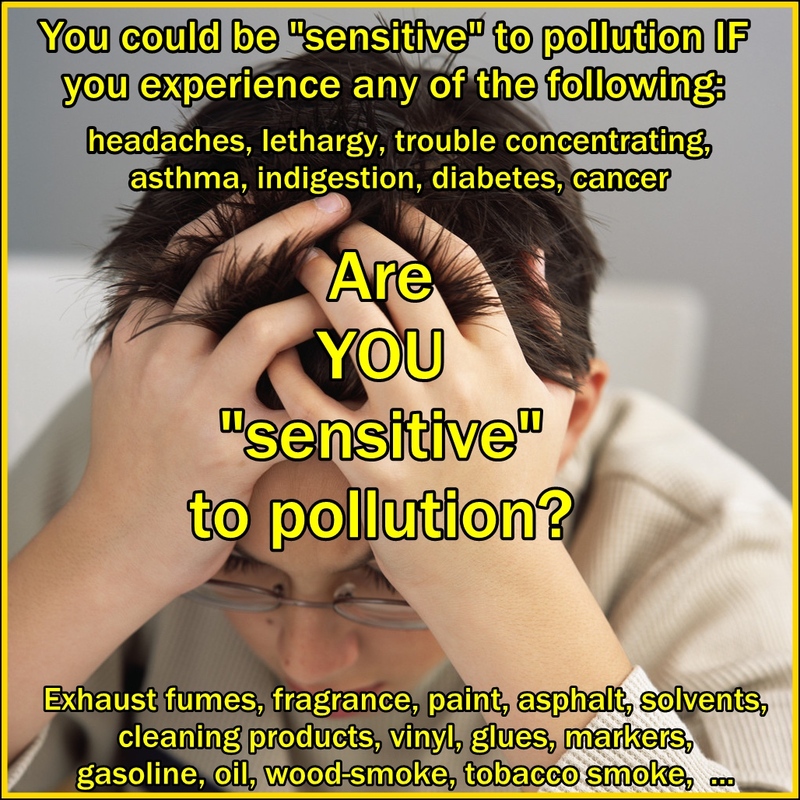 Symptoms of environmental sensitivities are unique to the individual. Some possible symptoms are summarised in Table 7. “Sensitivities may be initiated by a range of environmental factors and once the condition is initiated, reactions may be triggered by a broadening array of incitants. Environmental sensitivities may affect every system in the body, so multiple symptoms are possible, with variation among individuals. Neurological symptoms are almost universal. Common incitants are summarised in Table 6 and symptoms are summarised in Table 7. The impact of environmental sensitivities on workers’ performance may range from mild (e.g. habituation to chronic exposures such that performance may be sub-optimal, although not “abnormal”) to severe impairment such that work is impossible. It should be clear from the above, that chemicals acting in MCS are not acting on the classic olfactory receptors (15,16), but rather are acting as toxicants. This is opposite many published but undocumented claims that MCS is a response to odors. There is additional evidence arguing against the view that MCS is a reaction to odors. MCS sufferers who are acosmic, having no sense of smell, people who have intense nasal congestion and people whose nasal epithelia have been blocked off with nose clips can all be highly chemically sensitive (1,4). This does not necessarily mean that MCS never impacts the olfactory system. It simply means that MCS is not primarily an olfactory response. A recent study, confirmed this view, showing that the olfactory center in the brain in people with MCS was less sensitive to activation by chemical exposure than in normal controls, rather than being more sensitive (17). Pall M.L. (2009) Multiple chemical sensitivity: toxicological questions and mechanisms. Wiley & Sons, New York, in press. Having MCS/ES alone is bad enough, sadly though, too many people also have FM, and or CFS/ME along with MCS, in addition to other chronic conditions. Accessing health care to treat any of these is extremely difficult when one has MCS/ES. The consequences of poor indoor environmental quality and outdoor pollution have been known for decades. We really need more action to require that environments on this little planet are safe for all of us. This entry was posted in Disability, Environmental Health, Environmental Sensitivities, Indoor Air Quality, Multiple Chemical Sensitivities, Pollution, Precaution, Public Health and tagged allergies, autism, chemical sensitivity, Chemicals, Fragrance, gas, health, Human Rights, images, indoor air quality, MCS symptoms, oil, petrochemicals, pipeline accidents, sensitive to pollution, smoke, symptoms of exposure to petrochemicals, toxicology, volatile organic compounds. Bookmark the permalink. Our cyber community is globlal! The same issues are affecting people all over the world now. There are simply too many toxic chemicals and pollutants in everyday use. We were not designed to be polluted like this! Thanks So much for this. I am working with the people of the Gulf oil Spill and really need an intake form for them. I have been searching everywhere for Physicians to treat this. Thank You. I LOVE YOU FOR THIS THANKS SO MUCH.